Song Park said he was injured by closing elevator doors. Song Park said he knew Boston wasn’t the most accessible city before coming to Emerson. A Palo Alto native, he said he wanted to get out of California. But since moving to the east coast campus, he realized Emerson is less accessible than he expected. 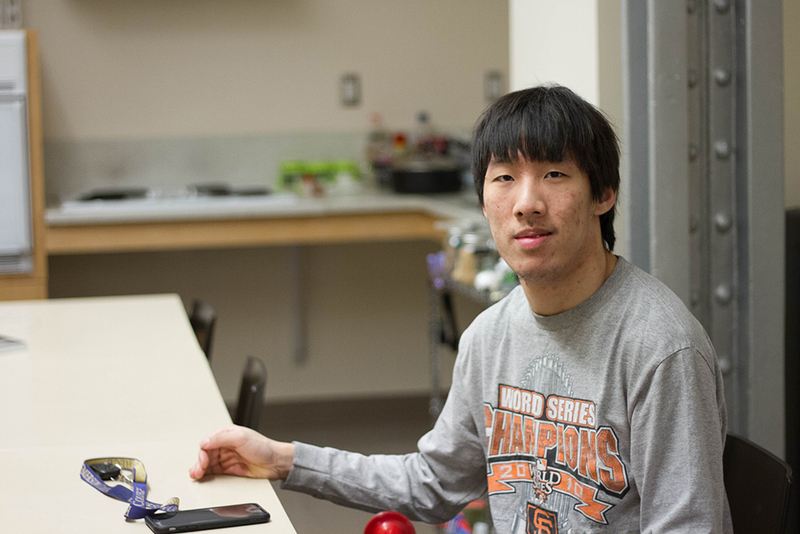 Park, a junior sports communications major, has cerebral palsy. He uses a walker to get around campus. He said a senior official assured him the administration would do everything they could to make the college accessible for him. But Park said he doesn’t feel that promise has been kept. When he spoke to the Beacon, Park described several accessibility issues he’s faced while on campus. Park said most of the college’s elevators are too small and close too quickly. He said the automatic doors don’t always open, and that the wind sometimes prevented them from opening. Facilities management replaced the automatic door motor in a Colonial Building entrance with a stronger one after it wouldn’t open in storm conditions, said Duncan Pollock, assistant vice president for facilities and campus services. Park is a resident of Colonial. Pollock estimated that eight door-open buttons have been replaced in the last year. When a door-open button fails, the automatic door it’s linked to will not open, he said. The Americans with Disabilities Act—a federal law that prohibits discrimination based on disability—ensures that people with disabilities have equal opportunity under the law. Diane Paxton, director of the Disability Services Office, said Emerson is in compliance with the ADA, which means any student can access all of its resources and facilities regardless of ability. But Emily Schnider, Student Government Association disabilities/accessibility commissioner, said that compliance doesn’t necessarily mean navigating campus is easy or convenient for those with disabilities. “It just means [students with disabilities] have a service to potentially get there,” Schnider said. Park said he intentionally took classes in the Walker Building, because it’s relatively close to the Colonial residence hall—144 feet away, according to Google Maps. Elevators in Walker are small. Park said he struggles to get in and out of them comfortably and that he can’t easily maneuver while standing inside the elevators. The building has a set of larger elevators at the Boylston Place entrance, but they don’t provide service to the third floor or any floors above the sixth. A substantial section of the alley is fenced off because of the construction of the new residence hall at 2 Boylston Place. Park said construction in the alleyway makes it harder for him to reach the elevators. Accessibility isn’t just a mobility concern—Park said it also affects his health and safety. He said elevator doors have closed on him multiple times, once injuring him enough to warrant a visit to Tufts Medical Center. In December, Park met with several members of administration, including Dean of Campus Life James Hoppe, to describe the issues he was facing. Hoppe said the discussion prompted him to start the Accessibility Advisory Committee, a nine-person panel composed of administrators from various departments, to make the campus more inclusive and accessible for students with disabilities. The committee has met once this year and will meet again at the end of this month, Hoppe said. Park and other students were invited to the first meetings to discuss issues they were facing on campus related to accessibility. Park will be graduating in two semesters and said he hopes Emerson will improve accessibility, even after he leaves for good. “I do care about the future of students,” Park said. Hoppe said he wants efforts like the accessibility committee to have a positive impact on the campus and accessibility in the future.